Leaky or old pipes? You may need a water line replacement. Call us for a free, no-obligation quote to find out what needs to be done. 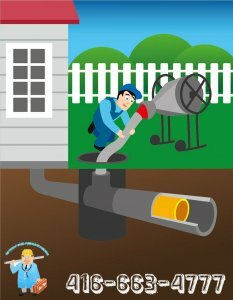 Your home has two sets of pipes traveling to and from it – a water line and a drain line. The drain lines are the pipes that carry wastewater away from your home to the sewer. The water lines are the pipes that carry clean water into your home. Because water lines are under pressure, they can potentially burst in a cold Toronto winter. Just like drain lines, they’re also susceptible to damage from root systems which leads to clogs and leaks. Fortunately, we offer a trenchless water line repair similar to our trenchless drain repair that can fix your problem quickly and efficiently. Time: Trenchless water line replacement means we don’t need to dig up your lawn to get to the water lines. While the traditional trench digging method can take days and leave you without a water supply, trenchless line replacement can be done quickly, often in just one day. Quality: We use both Perma-Liner and pipe bursting methods to replace your pipes to leave you with a seamless, joint free pipe that is resilient and will last for decades to come. Function: The seamless pipes used in trenchless replacement require less maintenance than traditional pipes and may also lead to improved flow capacity. Every job is different and the cost will depend on the amount of pipe that needs to be replaced. The benefit to trenchless water line replacement is that you’re going to be saving money on all the related expenses. Less time means less cost for labor and less digging means you don’t have to pay more for repairing damage to your lawn and landscaping, your driveway or anything else that would need to be dug up for a traditional repair. Trenchless water line replacement is going to save you money in the long run, not to mention the money you’ll save on maintenance down the road. We treat your home the way we expect workers to treat our homes. That means coordinating with you from the moment you call for a quote all the way through the final work we perform. Our team will cover and clean everything in their work area so you don’t have the added stress of a mess to tidy up and we’ll finish as quickly and efficiently as possible. We’ll even provide you with a video of your pipes when the work is done so you can see the work we’ve performed.